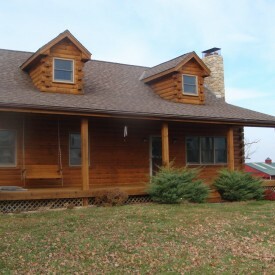 At 888-LOG-GUYS, we have the experience to give you the best log home care available in the Paducah KY area. Our staff has extensive log home knowledge to give you the best solution for your log home or log cabin. Our crew has the carpentry skills to deliver the best finished product. You will be beyond 100% satisfied with our work, and you will always have us to be there for your log home care needs. Contact us by phone or ask for a quote online to find out what 888-LOG-GUYS can do for you! It may be time to have your log home restored if your log home or log cabin hasn’t been cleaned or maintain in several years! 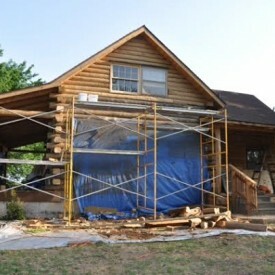 Our staff will be able to tell you what it is that your log home or log cabin needs to be rejuvenated. Our log home restoration process includes media blasting (corn cob, glass, sand, or walnut blasting), sanding, borate treatment, energy seal application, and staining. If you would like any of these log home services, then contact us right away! Do you feel as though your logs are deteriorating due to log rot? Have you noticed holes in your logs from insects or birds? If so, then don’t panic! 888-LOG-GUYS has you covered in the Paducah Kentucky area! We specialize in log repair or log replacement due to rot, weather damage, water damage, insect damage, or animal and bird damage. 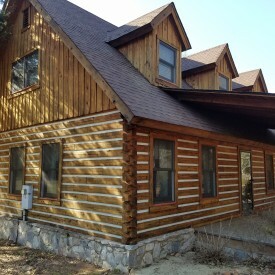 We want to fix your log home to bring it back to good condition. Call us today, or you can ask for a free estimate from our website! Why risk bothering with invading insects, water leaks, or air drafts in your log home or log cabin? Let 888-LOG-GUYS prevent those irritating problems by applying an energy seal (chinking or caulking) to your log home. We can also repair or replace your current energy seal application! Our crew is prepared to serve you in the Paducah KY area, so don’t delay! Contact us for your log home energy seal needs! Is there something you would like to add to your log home or log cabin? 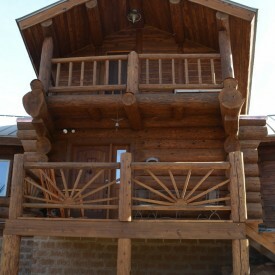 We can offer to build additions to your log home or log cabin that will increase its value and beauty. Our crew can build log staircases or log railings for your log home’s interior. We can construct decks, porches, or patios to complete the outside of your home. Whatever your are thinking you would like to add to your log home, call us or ask us for a quote online to see what we can do for you! Once our customer, always our customer! But whether you have used our log home services before or not, contact us to see how we can maintain your log home. We take very seriously the upkeep of your log home or log cabin, and we want to help you in the Paducah KY area. Our log home maintenance services will save you the time and stress that comes with log home care. Our maintenance packages will also save you money and not break the budget! If you give us call or ask for an estimate online, we can tell you how 888-LOG-GUYS is the best in the log home maintenance business!